A Powerful Way to Start Your Day! 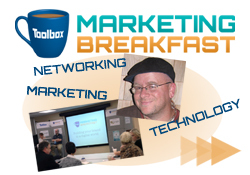 Marketing, Education, Technology & Breakfast! Network with people that really want to learn how to use today’s powerful technology tools to grow business. We currently have a marketing breakfast each quarter focusing on Marketing/Technology tools that make your life easier and potentially more profitable. At the breakfast you’ll have the opportunity to network with some of the best web designers, social media experts, internet marketing professionals and IT people on the South Shore. Couple that with breakfast and a great presentation on some marketing topic and you have the best start on the day to growing your business!